Mas Neuf is a luxury 2 Bed villa sleeping 4 plus baby. Located in the wonderful hills and renowned lavender fields of the Luberon, lies the beautiful resort of Pont Royal en Provence. Set deep within the folds of the Durance valley, the resort sits amongst a world-renowned 18 hole golf course. The resort provides a wealth of sporting activities and entertainment, catering for all members of the family’s interests, and is set around a village centre, complete with shops, bars and restaurants, all designed in traditional Provencal style. Pont Royal en Provence combines a wonderful resort with something for everyone, nestled within the outstanding Provencal landscape. Tear yourself away for a day or two, and discover Avignon, Aix en Provence and the wider region, for their colourful markets, festivals and spectacular architecture, whilst sampling some of the fabulous cuisine! Free Wifi available within the villa. Downstairs: WC /Cloakroom. Upstairs: House bathroom with large walk in shower, wash hand basin with plenty of storage, WC with quality fitting throughout. There is a hairdryer, hair straighteners and heated rollers. Baby bath if required. Notes on accommodation: There is electric heating. Air-conditioning in downstairs open plan living area and tower fans for bedrooms provided for use during the summer. There is a detailed visitor’s manual available in villa with plenty of information, instructions for the appliances and suggestions of places to visit and recommended restaurants. We have a fantastic bilingual agent for local information and assistance. Off road parking and underground secure car parking available on request. Cot (linen not provided), baby bath and high chair can be provided on request. Pool towels can be provided at a small extra cost to cover laundry bills. The kitchen is stocked with essentials you may need, oils, vinegars, herbs, spices, washing up liquid, washing powder, dishwasher powder, foil, cling film food bags, bin bags, tea lights, etc. All we ask is if you use the last of the above please replace it for the next guests. Free Wifi though-out the property Outside: There is a pretty private garden, facing south with a terrace, an outdoor table, 4 chairs, large parasol, gas barbeque, wrought iron sofa and garden chairs. The garden stocked with lavender, rosemary, mature shrubs and trees. Sun loungers, shower and WC at both shared private pools. The domaine of Pont Royal is gated with 24/7 security. 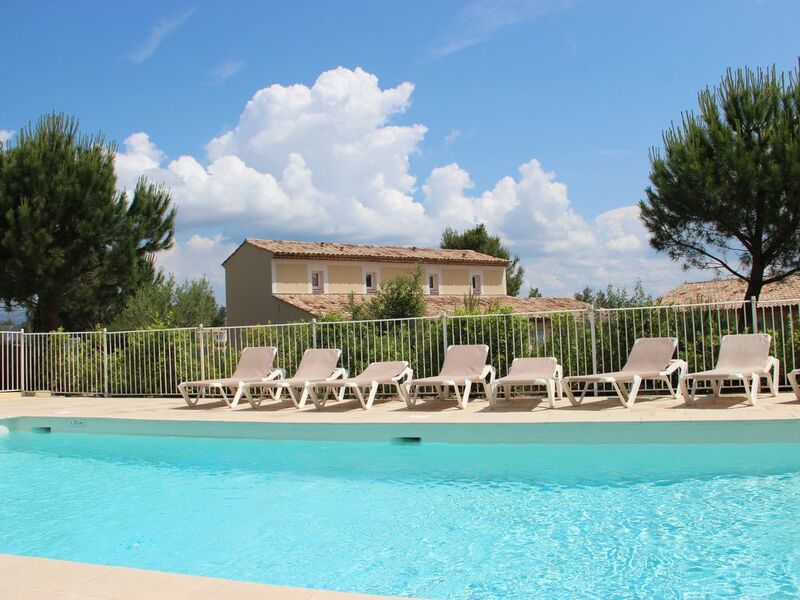 There is free private access to 2 shared swimming pools available within Trois Collines. First one is 12m x 6m only about 25 meters away from the house. The second one is larger infinity pool about 25 meters long situated 100 meters from the house. Utility Room: There is a fully integrated washer/dryer within the kitchen, along with an iron, ironing board, clothes airer, pegs and vacuum cleaner. Cleaning / Towels / Linen / Maid service: The property is cleaned at beginning and end of every stay. Additional cleaning is provided, if desired, at client's expense. Bed linen and towels are included. Bed linen is changed weekly. Towels can be washed when desired using the washer and dryer. Other: Bed linen and towels (excl. pool towels) are provided. Mid-stay linen and towel change are available for stays of 2 weeks or more. Towels can be washed using the washer and dryer. Pool towels can be provided at an additional charge. The house was lovely, lots of home comforts - they had everything utensil wise and were very accommodating in arranging baby equipment for us. We requested an additional travel cot and it was there in a matter of hours. The garden was quite small but there was a BBQ which we used a few times. The house was perfect for our stay and the pool nearby was very handy - less than a minute's walk. It was a bit of a walk into the centre of the resort so we did find we needed to drive but there was at least free parking. The pools there were lovely but it was expensive to use the rapid pools etc - €40 for two adults (kids were free). The only downside was that the house got quite hot upstairs although the fans did help somewhat. The aircon downstairs was very good. Overall a lovely stay and we would go back again. I stayed at the property with wife and 2 boys (10 and 12). The property was excellent - well equipped with everything that we needed, very clean with a nice garden where we usually ate dinner. The location was excellent, the two swimming pools were both really good and the kids loved these. There is also a putting green and driving range close by, which was excellent for one of my sons who loves golf and the main complex is a ten minute walk away. I would thoroughly recommend the villa - we had a great holiday. Closest beaches are around South Marseille and in the Carmargue Saint Marie de la mer or at Cassis - an ancient fishing port where the little fishing boats now share the harbour with yachts and a collection of tourist boats for visiting the calanques. Nice and St. Tropez are around a 2 hours drive away. By Road: Pont Royal is 10km (6 miles) from the autoroute A7 between Avignon and Marseille. Exit at Junction 26 (Senas). By Air: Avignon/Marseille - 30-40 mins, Nimes/Montpellier - 50-60 mins, Nice/Toulouse/Toulon/Grenoble/Lyon - within 2 hours. The airlines that service these airports are: Easyjet, Jet2, British Aways, Bmibaby, Flybe, Ryanair, Aerlingus, Thomsonfly, Southwest Air. By Train: TGV stations at Avignon/Aix en Provence 30 minutes. Car hire is highly recommended. Great places to visit for historic interest - Arles, Avignon, Nîmes, Pont du Gard. Some of the most stunning villages in France - Lourmarin, Lacoste, Bonnieux, Menerbes, Gordes, Ansouis. Trips for wine lovers - Chateauneuf du Pape. For shopping, the arts, the most famous antique market in France - Salon de Provence, Aix En Provence, Isle Sur la Sourge. Weather - There are more than 300 days of sunshine in this part of Provence and is normally warm and sunny from April to November with the warmest months being July and August. Pont Royal facilities - There are many sports activities within walking distance of our house: Bicycle Hire, Floodlit tennis courts, Horse riding, Table Tennis, Basketball, Football, Volleyball. Some are seasonal and may incur a charge at the reception centre in the village. As well as the share private pools near our villa, there are several swimming pools and one waterslide within the village area of Pont Royal, which our children love. Boules are often played in La Place de la Mairie. There are many scenic walking/jogging trails around the village. The spectacular golf course is described above. Within the Pont Royal estate, there is a small supermarket, a gift shop, a wine shop, a newspaper agents, Post Office and tourist information. You will also find a number of excellent restaurants, all suitable for families. The Pont Royal estate is gated with 24/7 security. An ATM can be found in P&V reception in Pont Royal village. Nearby Village - Mallemort only 3km away has a large supermarket, some great patisseries for the essential baguettes and croissants, a butchers, doctors, pharmacy, bank, post office, tourist information office and a wonderful outdoor market every Friday morning. Local activities include - hiking, Cycling, Canoeing, Golf, Horse riding, Fishing, Mountain biking, Tennis, Tree Trekking.